— SAS is a privately held company. Founder and CEO Jim Goodnight owns a controlling interest. — Goodnight is 71 years old. — Goodnight’s children are not engaged in management of the business. Within the next few years, SAS faces a dual transition of management and ownership. This should be a concern for customers and prospective customers; due to SAS’ proprietary architecture, building on the SAS platform necessarily means a long-term bet on the future of the company. Suppose, for example, that IBM acquires SAS: will SAS continue to support interfaces to Oracle and Teradata? Succession is a problem for any business; it is especially so for a founder-managed business, where ownership must change as well as management. Goodnight may be interested in SAS as a going concern, but his heirs are more likely to want its cash value, especially when the IRS calls to collect estate taxes. Large founder-managed firms typically struggle with two key issues. First, the standards of corporate governance in public companies differ markedly from those that apply to private companies. The founder’s personal business may be closely intermingled with corporate business in a manner that is not acceptable in a public company. For example, suppose (hypothetically) that Goodnight or one of his personal entities owns the land occupied by SAS headquarters in Cary, North Carolina; as a transaction between related parties, such a relationship is problematic for a public company. Such interests must be unwound before an IPO or sale to a public company can proceed; failure to do so can lead to serious consequences, as the Rigas brothers discovered when Adelphia Communications went public. The other key issue is that founders may clash with senior executives who demonstrate independent thought and leadership. Over the past fifteen years, a number of strong executives with industry and public company experience have joined SAS through acquisition or hire; most exited within two years. The present SAS management team consists primarily of long term SAS employees whose leadership skills are well adapted to survival under Goodnight’s management style. How well this management team will perform when out from under Goodnight is anyone’s guess. SAS flirted with an IPO in 1999, at the height of the tech-driven stock market boom, and hired ex-Oracle executive Andre Boisvert as COO to lead the transition. Preparations for the IPO proceeded slowly; Boisvert clashed with Goodnight and left. SAS shelved the IPO soon thereafter. Subsequent to this episode, Goodnight told USA Today that talk about an IPO was never serious, that he had pursued an IPO for the benefit of the employees, and abandoned the move because employees were against it. In the story, USA Today noted that this claim appeared to be at odds with Goodnight’s previous public statements. The reader is left to wonder whether the real reason has something to do with Goodnight’s personal finances, or if he simply did not want to let go of the company. In any case, it’s not surprising that many SAS employees opposed an IPO, since Boisvert reportedly told employees at a company meeting that headcount reduction would follow public ownership. Since then, there have been opportunities to sell the company in whole or in part. IBM tried to acquire the company twice. Acquisition by IBM makes a lot of sense; SAS built its business on the strength of its IBM technology partnership; SAS still earns a large share of its revenue from software running on IBM hardware. Both companies have a conservative approach to technology, preferring to wait until innovations are proven before introducing them to blue chip customers. But Goodnight rebuffed IBM’s overtures and bragged about doing so, claiming an exaggerated value for SAS of $20 billion, around ten times sales at the time. It’s not unknown for two parties to disagree about the value of a company. But according to a SAS insider, Goodnight demanded that IBM agree to his price “without due diligence”, which no acquiring company can ever agree to do. That seems like the behavior of a man who simply does not want to sell to anyone, under any circumstances. Is SAS really worth ten times revenue? Certainly not. SAS’ compound annual revenue growth rate over the past twenty years is around 10%, which suggests a revenue multiplier of a little under 4X at current valuations (see graph below). Of course, that assumes SAS’ past revenue growth rate is a good indicator of its future growth, which is a stretch when you consider the saturation of its market, increased competition and limited customer response to “game-changing” new products. One obstacle to sale of the company is Goodnight’s stated unwillingness to sell to buyers who might cut headcount. 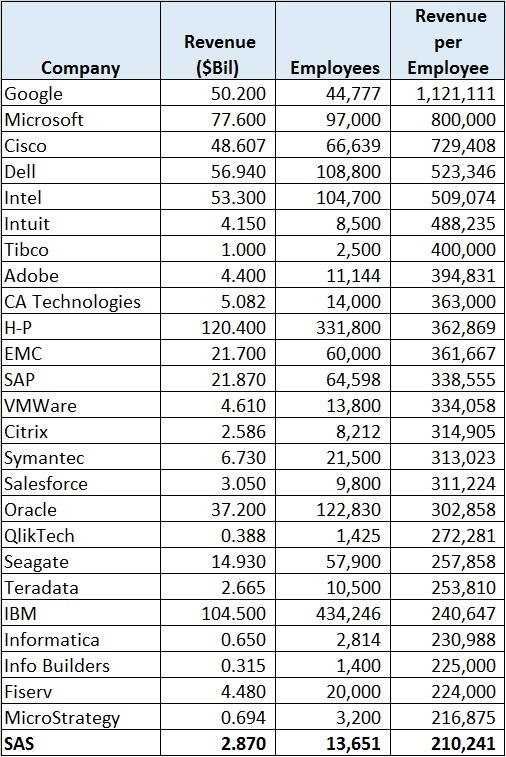 SAS’ company culture is the subject of business school case studies and the like, but the unfortunate truth is that SAS’ revenue per employee badly lags the IT industry, as shown in the table below. SAS appears to be significantly overstaffed relative to revenue compared to other companies in the industry, and markedly so compared to any likely acquirer. One could speculate about the causes of this relatively low revenue per employee — I won’t — but an acquiring company will expect this to improve. Flogging the business for more sales seems like pushing on a string — according to company insiders, SAS employs more people in its Marketing organization than in its Research and Development organization. An acquirer will likely examine SAS’ product line, which consists of a few strong performers — the “Legacy” SAS software, such as Base and STAT — and a long list of other products, many of which do not seem to be widely used. Rationalization of the SAS product line — and corresponding headcount — will likely be Job One for an acquirer. So what’s ahead for SAS? One option: Goodnight can simply donate his ownership interest in SAS to a charitable trust, which would continue to manage the business much the way Hershey Trust manages Hershey Foods. This option would be least disruptive to customers and employees, and the current management team would likely stay in place (if the Board is stacked with insiders, locals and friends). It’s anyone’s guess how likely this is; such a move would be consistent with Goodnight’s public statements about philanthropy, but unlike Larry Ellison, Goodnight hasn’t signed Warren Buffett’s Giving Pledge. But if Goodnight needs the cash, or wants his heirs to inherit something, a buyer must be found. Another plausible option consistent with Goodnight’s belief in the virtues of private ownership would be a private equity led buyout. The problem here is that while private equity investors might be willing to put up with either low sales growth or low employee productivity, they won’t tolerate both at the same time. A private equity investor would likely treat the Legacy SAS software as a cash cow, kill off or spin off the remaining products, and shed assets. The rock collection and the culinary farm will be among the first to go. There are a limited number of potential corporate buyers. IBM, H-P, Oracle, Dell and Intel all sell hardware that supports SAS software, and all have a vested interest in SAS, but it seems unlikely that any of these will step up and buy the company. Twice rebuffed, IBM has moved on from SAS, reporting double-digit growth in business analytics revenue while SAS struggles to put up single digits. H-P and Dell have other issues at the moment. Oracle could easily put up $10 billion in cash to buy SAS, and Oracle’s analytic story would benefit if SAS were added to the mix, but I suspect that Oracle doesn’t think it needs a better analytics story. SAP has the resources to acquire SAS; a weak dollar favors acquirers from outside of the United States. Such a transaction would add to SAP’s credibility in analytics, which isn’t strong (the recently announced acquisition of KXEN notwithstanding). Until recently, there was no formal partnership between the two companies, and SAS executives spent the better part of the last SAS Global Forum strutting around the stage sniping at SAP HANA. It will be interesting to see how this alliance develops. A reader on Twitter asks: what about employee ownership? Well, yes, but if Goodnight wants to sell the company, the employees would need to come up with the market price of $10-11 billion. That works out to about $750,000 for each employee. There are investors who would consider lending the capital necessary for an employee-led buyout, but they would subject the business and its management to the same level of scrutiny as an independent buyer. Jesus Christ, Thomas, they’re not rocks they’re MINERALS!!! Actually Jim, some items in your collection are rocks. How about now? Mikael Hagstrom gone for McKinsey. Jim Davis gone for Informatica. Carl Farrel becoming the one and only heir with a great timing. Pancho, thanks for reading. Davis’ move is lateral — same job, smaller company — while Hagstrom’s seems like a bump up. Farrell replacing Davis as #2 suggests greater focus in sales growth over product development. So what about now? Davis leaving INFORMATICA. My bet is he´s going back to the nest. What´s your bet? If “nest” means his hammock, I’ll take that bet. Nah! I think he´ll be back at SAS sooner or later. Yes, there are similarities, although SAS is in better shape than TDC. For starters, they’re selling at the top of the value chain, while Teradata chugs along at the bottom. Also, Teradata is hooked on a business model that requires stuffing the channel with perpetual licenses, while SAS has always run on a subscription model. I tend to agree with Tom… since the points he mentions are part of the prioritites TD is working heavily on these days. Although, on the other side, I hear more and more from clients fed up with the “abusive” suscription licensing model from SAS and many of them want out of that through Open Source like “R” and the new Hadoop technologies. I don’t often defend SAS, but their subscription licensing model is a strength. 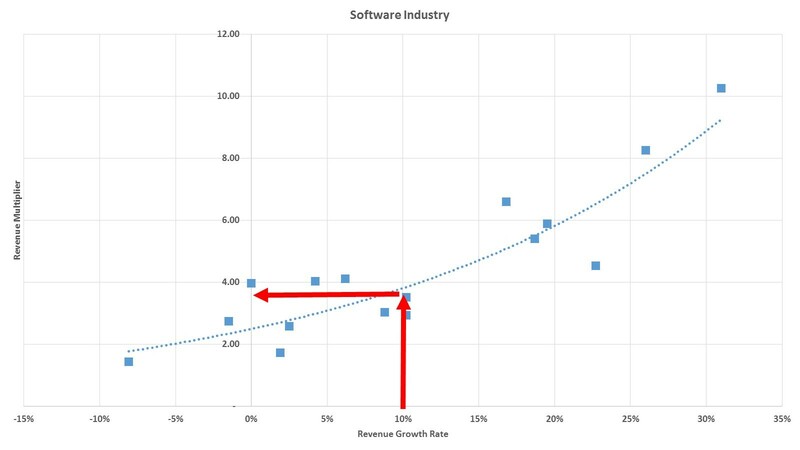 Most software companies are moving to subscription pricing as fast as they can. SAS is already there. The problem with SAS pricing isn’t the subscription model but the relationship between price and value. SAS has set the price of its subscription licenses too high, and every new feature requires another license. That is true. You nailed it – SAS needs to shorten the gap between their pricing and the real value they deliver at the customer. 80% of their customer base is still uses it for “querying and reporting”, and no one is taking care of that, from my own experience. I just learned that Mr Farrell is no longer with SAS. Is that correct? What´s your read on this? Let’s just say that after five years of flat revenue, it may be time for a new Chief Revenue Officer. New COO at SAS. What´s your read on this? Oliver is the new heir apparent. What is your take on Oliver and the new product direction to embrace open source. Honestly, I have no opinion about Oliver. Not sure I would characterize SAS strategy as embracing open source. A couple of APIs on Viya don’t count as an embrace. “The hamburger business, of course” was the student’s response. Abstract this into whatever other business situation you like. It’s just a hypothetical. With regards to employee productivity, why have a single competent employee who is productive when you can have four incompetent sycophants churn garbage and take up space? In what business model does that make sense? The hamburger business, of course. 5 years later, Jim & SAS are stronger then ever before, the rocks are actually minerals, but your predictions don’t rock. Any new ideas Thomas? Five years later, I stand by what I wrote. While it’s true that SAS is still in business, it’s difficult to argue that the company is “stronger than ever.” The revenue figures say otherwise, as does declining loyalty to SAS among enterprise buyers. SAS Global Forum increasingly looks like an AARP meetup, which does not bode well for the future. And, while everyone wishes Jim a long and productive life, SAS continues to face the ownership crisis that I outlined five years ago. Not only the decline of loyalty of customers. But also of employees. Sas isn’t what it used to be. What are you thoughts now on selling Sas. Rocks and Hamburgers. Hmmm… What distinguishes minerals from rocks is that their structural elegance — which elicits an immediate reaction from human onlookers — is based on a sophisticated algorithm. What distinguishes SAS from the open source imitators is the depth and beauty of its algorithms. And they in turn reflect the depth and beauty of the minds of the people who work there. I know some of them, and I believe in the future of this company. I also believe that rational discourse is fundamental to the survival of our species, and this column was a very rational analysis, for the most part. Best wishes.